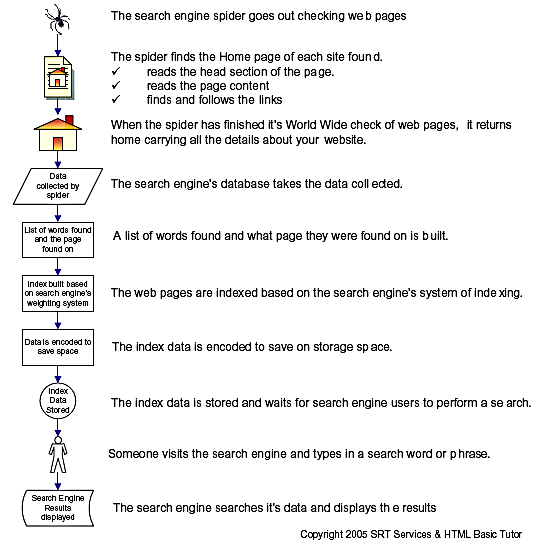 Search engine indexing is done once the search engine spider (web crawler) returned from it's web crawl. Refer to our Web crawler article to see what information it collects. The search engine indexing process takes the detailed information collected by the search engine spider (web crawler) and analyses the information. 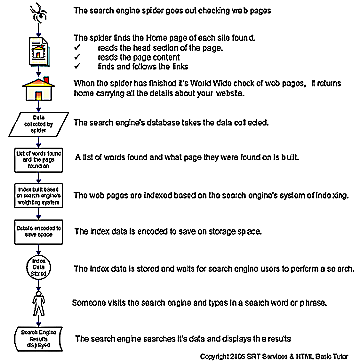 Click the image above to view a diagram of the search engine indexing process. Number of times a word/phrase is used on the web page. The search engines consider a web page where the word or phrase is used to excess to be spam and an unethical attempt to get listed without providing quality content for the website visitors. One of the most important steps in improving your site's ranking in Google search results is to ensure that it contains plenty of rich information that includes relevant keywords, used appropriately, that indicate the subject matter of your content. Source: Webmaster Help Center - How can I create a Google-friendly site? The weight of the word/phrase increases in value depending on where it is located. Each search engine has a different way of analyzing this information therefore different results in the search engines is the result. A web page may do well in the search engine results on one search engine and poorly on another. The indexed information is saved in a database, waiting for someone to do a search. When someone does a search at the search engine (or directory), the words they entered in the search box are compared with the indexed information in the search engine's database and the list of web pages it feels are most relevant to the search are returned. None of the search engines publish how often their indexes are updated. They are always looking for fresh new content to add to their index so, adding new original content to your website or blog will help. As other people find your website or blog on their own and start to link to it because they find it valuable to their readers, the search engine bots will find and follow the link. This will give the search engine bot an opportunity to have a look to see if you have any new content to index. Making sure that all the links within your website/blog are working is another way for the search engine bots to find new and updated content to index. Going over board on looking for linking partners though isn't going to help get your website or blog indexed or reindexed. The search engines are wise to this and may even stop them from visiting your site, eliminating you from the search engine indexing process. Web Crawler, Search Engine Robots and Search Engine Spiders To perform search engine optimization (SEO) on a web page you first need to understand how search engine spiders (web crawlers) work. What Search Engine Spider Software Looks For All the search engines look at the words in a web page and record where they found the words. Each search engine has a different way at looking at the web page. Search Engine Indexing is done once the search engine spider (web crawler) has returned from it's web crawl. The search engine indexing process.